Human rights NGOs slam Hungary's decision to target billionaire philanthropist's campaign to flood Europe with migrants. Several human rights NGOs on Friday slammed Hungary's new "national consultation" targeting George Soros and what Budapest says is the billionaire philanthropist's intention to flood Europe with a million migrants per year. The campaign, accompanied by a blitz of billboards and TV advertisements, will from Sunday see the government send households questionnaires seeking opinions on this "Soros Plan." This is thought to refer to proposals by the Hungarian-born Soros, long a bete noire for European nationalists and conspiracy theorists, in a 2015 opinion piece in the midst of Europe's migrant crisis. It included the European Union accepting at least a million asylum seekers annually as part of a global response to vast numbers of people fleeing Syria and other conflict zones. Since then, thanks in large part to a 2016 deal between Brussels and Turkey, the number of people risking their lives crossing the Aegean to EU member Greece has dwindled. Large numbers have crossed the Mediterranean to Italy although these too have fallen since mid-July, reportedly due to Libyan militias ending their involvement with trafficking. Human Rights Watch said that the Hungarian government's claims in its new "hate campaign" are "a very distorted half-truth, as Brussels is asking EU governments to resettle only 50,000 refugees over two years." The campaign will likely fuel a "hostile climate for civil society driven by campaigns to smear real and perceived government critics" and is to distract voters ahead of 2018 elections, HRW said. Amnesty International's Hungary director Julia Ivan called the campaign, which follows a similar one earlier this year, "absolutely absurd and unbelievable." 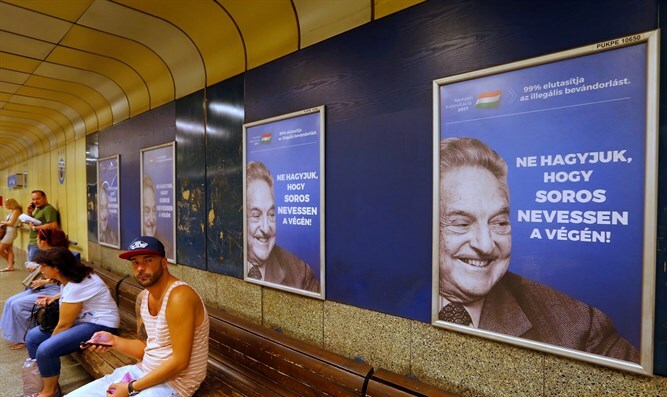 That earlier campaign included billboards -- some were daubed with anti-Semitic graffiti -- described as "poisonous" by Hungary's main Jewish organization. The new questionnaire will ask whether Hungarians support certain ideas such as Soros wanting to "dismantle (EU) border fences" and "milder criminal sentences" for migrants. Another states that Soros, 87, wants to "push the languages and cultures of Europe into the background" and to "severely punish" countries that oppose immigration. Hungarian Prime Minister Viktor Orban has called immigration "poison" and a "Trojan Horse for terrorism," accusing Soros of seeking to undermine Hungary by funding civil society groups. In 2013, a report by NGO Monitor showed Soros to be funding the Israeli-Arab conflict by supporting anti-Israel groups.